A black and white photograph of 150 Brock Street North. 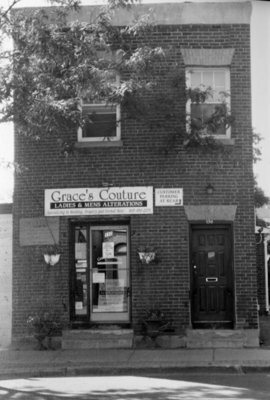 The sign on above the door is for Grace's Couture Ladies & Mens Alterations. The two storey brick building at 150 Brock Street North was building in 1862 by John Vandal Ham as his law office. 150 Brock Street North, October 2005, Carl Ferencz. Whitby Archives A2013_017_003.